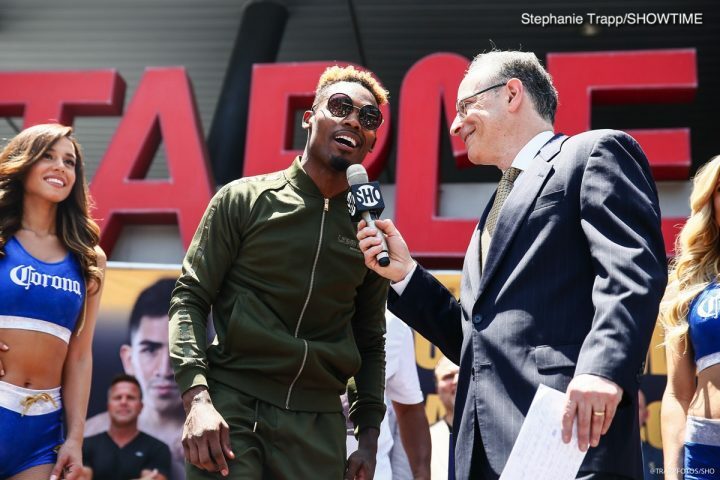 By Allan Fox: Jermell Charlo believes that he and his brother former IBF junior middleweight champion Jermall Charlo should both be rated in the top 10 in the pound-for-pound lists. As of now, neither fighter is rated top 10 in Ring Magazine’s P-4-P list. The unbeaten Jermell (30-0, 15 KOs) will be defending his WBC junior middleweight title against former 154lb champion Austin ‘No Doubt’ Trout (31-4, 17 KOs) this Saturday night on Showtime as presented by Premier Boxing Champions at the Staples Center in Los Angeles, California. Looking at Jermell’s resume in the last five years, it’s easy to see why he’s not ranked in the top 10 pound-for-pound. Charlo’s opposition has been horrible with the exception of his fight against the unproven Lubin. Charlo still hasn’t faced any of the proven quality fighters in the 154lb. weight class like Erislandy Lara or Jarrett Hurd. At this point, 21-year-old WBO junior middleweight champion Jaime Munguia or former IBF 147lb champion Kell Brook would be a tremendous step up in class for the 28-year-old Charlo. The pound for pound list is for fighters that that have shown that they can beat the best fight after fight. Charlo and his brother Jermall haven’t done that. The above list are the only name fighters that Jermall has fought during his career. The rest of the guys are C-level opposition. Jermall doesn’t belong in the top 100 with the guys he’s faced and neither does his brother Jermell. Once they start fighting opposition with a pulse, then and only then you can consider them for the pound for pound list. “Some critics say that me and my brother haven’t fought the people required to be on the pound-for-pound list. My race to the top continues Saturday night to prove all those people wrong,” Charlo said. I’m afraid that Jermell’s fight tonight won’t prove anything at all other than the fact that he can beat a shopworn Trout, who has lost two out of his last three fights. If Charlo wants to impress boxing fans, then he needs to lean on his manager Al Haymon to match him up with IBF/WBA junior middleweight champion Jarrett Hurd and Erislandy Lara in consecutive fights. Believe me; if Charlo beats Hurd and Lara, he’s going to be on The Ring’s top 10 pound-for-pound list. The problem is, I don’t think Charlo can beat Lara and Hurd. Those fighters are proven, and have a lot of punching power. Charlo is a good fighter, but the fact that he couldn’t even beat Martirosyan without controversy shows the limits of his talent. You can argue the only reason Charlo as looked good recently is because he’s fought these guys: Lubin [totally inexperienced], Hatley, Jackson and Alcine. Charlo has been matched weakly by his management since what should have been a loss against Martirosyan. Charlo is a good fighter, but he’s more of a contender level guy than a true champion. He’s merely a belt holder, and if he ever faces Lara or Hurd, his talent limits will be exposed. “I look to do what my brother did against Trout, but way better,” Trout said. ”If that’s with a knockout or just picking him apart, I’m ready. I’m fighting for a lot more than just a win. We’re going to keep shining and do what we have to do,” Charlo said. It’s doubtful that Charlo will be able to knockout Trout unless he catches him with a good shot early on and then blitzes him. But if Charlo does that, he may get knocked out himself if he bum rushes Trout. Charlo doesn’t have the greatest chin in the world, and if he gets hit with a shot while he’s going for the knockout, it could night over for him. Charlo should focus on just trying to box his way to a victory, because he doesn’t possess the offensive skills to knockout a fighter like Trout. If Jermall, Lara and Canelo couldn’t knockout Trout, then Jermell won’t be able to do the job. The 32-year-old Trout was just stopped in the 10th round in his last fight by Hurd. It could be that the wear and tear that Trout suffered in that fight, as well in his losses to Jermall, Canelo and Lara may have caused his boxing skills to deteriorate to the point where Jermell can knock him out. Nonetheless, Jermell shouldn’t get it twisted by thinking that he can beat Jarrett Hurd, Canelo or Lara if he’s able to KO Trout, because I don’t think that would be the case. I would pick Hurd, Canelo and Lara to beat Jermell with ease, because he’s not that kind of a fighter. He’s more of a Martirosyan level guy. Hurd may indeed be there tonight for the Charlo vs. Trout fight. Charlo staring Hurd down isn’t going to mean much if he’s not going to be facing him next. It’s unclear when precisely Charlo will be facing Hurd. We know that Hurd wants the fight against Charlo right now, but I’m not sure that the feelings are mutual. Charlo seems more interested in name dropping Hurd’s name than he is in fighting him.